A double whammy with two cafés in one day. We have decided to return to The Bronzed Onion because it was only after we had ordered that we saw their signature dish of the same name being served. Here’s an idea though… show it on the lunch menu! Our waitstaff was extremely fast and friendly. The frappe being rushed out to us at one point with the words “hurry, sip – it’s melting” probably sums up the restaurant as a friendly, fun environment with a large variety of flavours you don’t normally come across. Like an oasis for dehydrated beachgoers and just a short walk from Freshwater Beach, The Bronzed Onion is known for the dish of the same name and its wide selection of steaks. For lunch they feature a large drinks menu including alchoholic beverages, small & large meals and a frequently changing specials board. There is a large array of fresh juices, coffees, teas, milkshakes, smoothies and iced drinks to choose from. 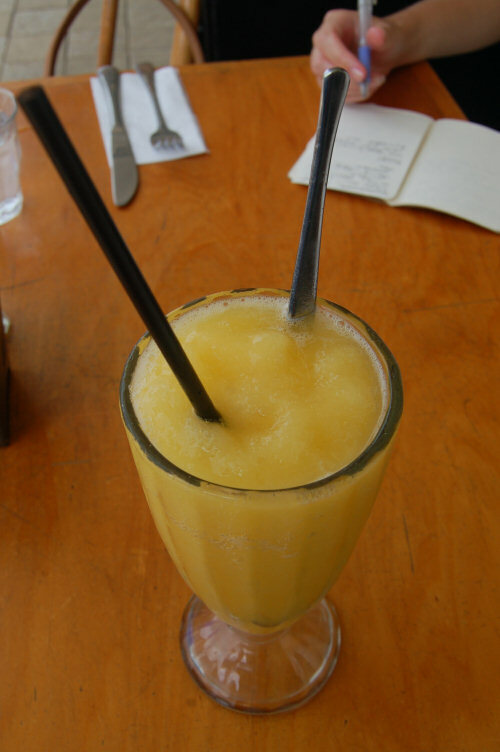 The chilled mango and raspberry frappes ($5.50) were sweet and refreshing. There did seem to be some ingredients beyond fresh fruit but one can’t argue with flavour. The turkey sandwich ($11) was delicious and a very generous serving. 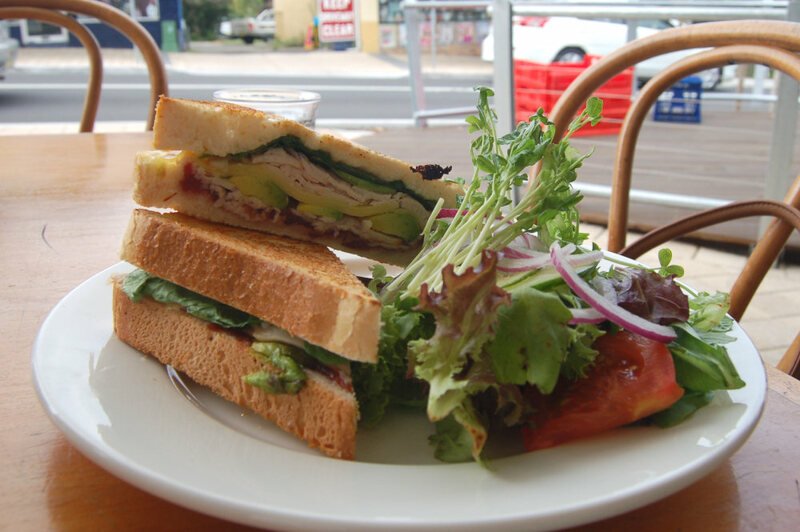 It featured layers of turkey, avocado, rocket, tasty cheese and cranberry sauce. The melted cheese helped to mesh all of the flavours together and the rocket had a strong bite to it. The salad was slightly bland as it was undressed. With so many great-sounding dishes on the menu, we figured a mixed plate was in order. 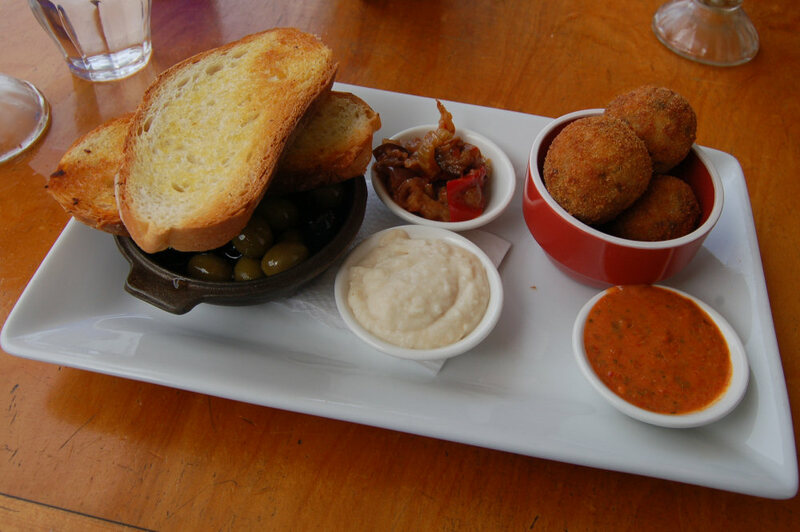 The mixed tapas plate ($15) contained one of the regular dishes we were especially keen to try: Croquettas Con Mojo ($13). They are fried lemon, herb and parmesan risotto balls. We would have been happy to have them by themselves as the hot burst of flavoured risotto inside was incredible but they are accompanied by the house mojo sauce, a spiced (but not spicy) secret concoction that gave the risotto balls a great kick. The small bowl of caponada (a Sicilian sweet & sour eggplant dish with sultanas, red capscium and celery) represented some great new flavours and made a perfect topping to the sourdough toast. Beneath the toast rested a bowl of olive and garlic tostadas. Finally, the small bowl of hummus was a triumph – how can such a simple dip contain so much flavour? A great combination that would make a good starting point to get used to a new world of flavours that The Bronzed Onion represents. While we feel we did not do The Bronzed Onion justice with the small number of dishes we ordered, stay tuned for a return review in the coming months. There is enough to call us (and you) back again. 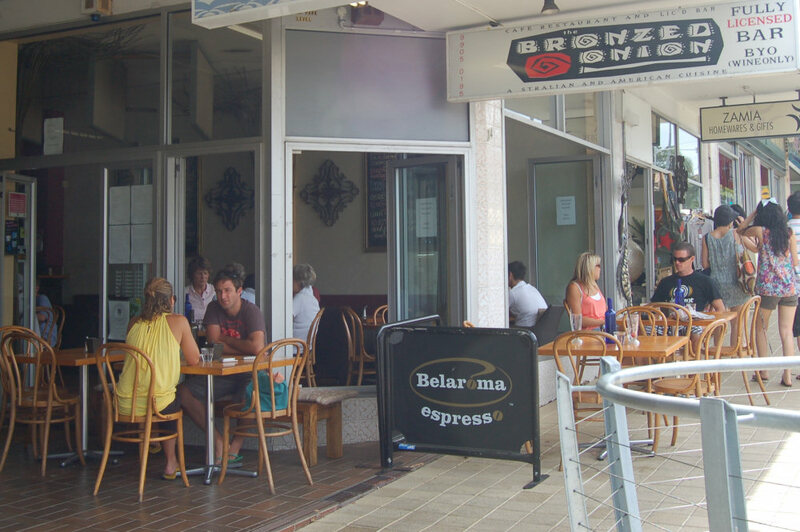 This entry was posted in Sydney - North Shore and tagged Outdoor seating. Bookmark the permalink.